In the 153th version of the Alo Sruti Patrika (Published and freely distributed to people with severe eye sight problem by Kiran Talking Newspapers), Nupur School of Rabindra Sangeet was featured. In a very easy and open environment, our principal Smt Pompa Dhar talked about her life and how she established this school. She shared the history of starting Nupur. Few of the Nupur students also sang few Rabindrasangeets for this version of the Alo talking newspaper. Here is a clip taken from this newspaper for you all. Alo Sruti Patrika is doing a brilliant job trying to enrich the lives of people with blindness or very bad eye sight. We wish them all the best. If you know any bengali speaking blind person, you could pass their details to Alo Sruti Patrika. That way, they would get Alo Sruti Patrika delivered to them over post (for free). Nupur School of Rabindra Sangeet had its annual program – ‘Shurer Surodhoni’ – on 12th May 2013, to commemorate Rabindranath Tagore’s birth anniversary ( Rabindra Jayanti) . The program was held at the ‘Mahatma Gandhi Hall’ in the Indian YMCA auditorium at Fitzroy Square. Every year, this program is constituted of solo songs by every student of Nupur , selected by themselves, as their tribute to Tagore. This year, there were some guest artistes as well with their rendering of Tagore’s songs and poetry. The variety of songs and the different styles of presentation made the evening thoroughly enjoyable. 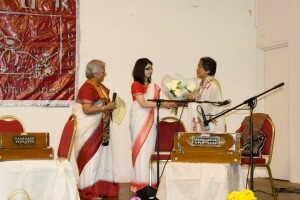 It was well attended by members of the Bengali community in London. Rabindra Jayanti celebrations are a tradition of Nupur since its inception more than 35 years ago. This year’s program was conceptualised and organised by the Principal of the school, Mrs. Pompa Dhar and other senior members , and assisted by all students of the school. It was also accompanied by expert musicians , Gautam Shikder on Tabla and Mridul Saha on Mondira. Mrs. Dhar played the Harmonium with most of the artistes where Amrita Ghosh, another student, played with a couple of artistes. On behalf of Nupur , we would like to thank all attendees for their presence and support that evening and we look forward to continue with this tradition in future.